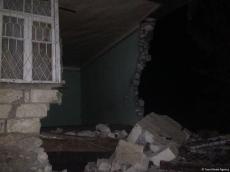 More than 130 houses were damaged as a result of the earthquake in Azerbaijan’s Aghdam district, Head of Aghdam District Executive Power Ragub Mammadov told Trend. He said that the investigation continues to estimate the damage to houses in villages of the district. A 5.7 magnitude earthquake hit Aghdam district Nov. 15 at 11.48 p.m. (GMT +4). The quake destroyed three houses in Tartar district of Azerbaijan, Deputy Head of the Tartar Region Ramiz Shabanov told Trend. He said that three houses and one stall were destroyed in Ismayilbeyli and Evoglu villages and six houses were damaged. "The number of damaged houses may increase," he said.